If you camp frequently, you'll likely cross paths with a few skunks from time to time. Skunks commonly live in open land near forests, along lakes and streams and in thick, wooded areas. 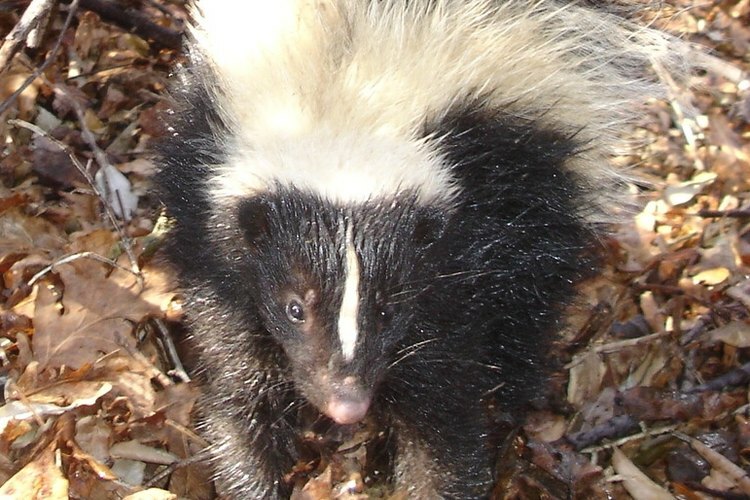 Most feared for their spraying abilities, skunks are also known carriers of rabies. Know how to repel skunks on your next camping trip, to enjoy the great outdoors without the worry. Eliminate food sources that attract skunks. Dispose of all of your garbage and food waste. Make sure your garbage can has a snug fitting lid to reduce odors that attract skunks. Keep all of your daily food supplies in tightly sealed containers out of a skunk's reach. Skunks do not typically climb to get to food and are weak jumpers. Store your dry food safely in your car while you keep your cold food in cooler that is sealed and latched. Use commercial products that repel cats and dogs. These products work on skunks as well and are available for purchase at your local pet store. Sprinkle repellent granules along the perimeter of your campsite or the area that you want to repel the skunk from. Reapply the granules according to the manufacturer's instructions. Make your own skunk repellent and take it on your camping trip. Pour one quart of water into a pot. Add in 1/2 of a fresh jalapeño pepper along with 2 tbsp. of cayenne pepper. Boil the water and pepper mixture for 20 minutes. Remove the jalapeño from the mixture and let it cool. Pour the remaining liquid into a spray bottle to use it as repellent. Spray the mixture around the perimeter of your campsite. Reapply the mixture around the perimeter of your campsite daily. Place vinegar soaked rags around your campsite at night. Saturate old rags with vinegar and place them on the perimeter of your campsite. Skunks are repelled by the the noxious odor. Remove the rags each morning and store them in a sealed container. Reapply vinegar to the rags each night before you use them. Keep your campsite well lit at night. Skunks are nocturnal animals and prefer to prowl under the cover of darkness. Bright lights work to repel skunks but be forewarned that they may attract unwanted bugs. Keep your vinegar and water handy, in the event that a skunk sprays your pet or your camp gear. A simple vinegar and water solution works to remove skunk odors from people, animals and objects.